Find out how to make a spirulina smoothie loaded with superfoods that tastes tropical and delicious! I think the first time I heard about spirulina and its amazing health benefits was from one of my favorite inspiring vegan athletes, Rich Roll. Rich had posted his top plant-based proteins and spirulina was on the list. Next thing I knew I was scooping up spirulina from the bulk bin and adding it to my daily smoothie – especially on strenuous workout days. I add one teasspoon of spirulina to my smoothies and though it dyes the smoothie rich green, I really don’t taste it. This week I made a super green smoothie with spirulina, kiwi, and tropical fruit. It is incredibly refreshing and a great way to recharge after a workout or just to get you through that afternoon slump. Spirulina is a blue-green microalgae that’s been consumed for centuries. A collection of superfood smoothie recipes from turmeric, to matcha, to pitaya, acai, maca, and more! A tropical citrus turmeric smoothie is so refreshing and nourishing. This gold turmeric smoothie is a delicious breakfast or snack. A refreshing, antioxidant rich fresh cranberry berry smoothie. This wholesome green smoothie has tropical flavors thanks to mango, pineapple, and coconut. This smoothie was inspired by my favorite Whole Foods green smoothie. This maca smoothie tastes like a chocolate malt but is so much healthier. Spirulina has many health benefits. With a deep green color like this, it’s not hard to believe that spirulina is loaded with nutrients. 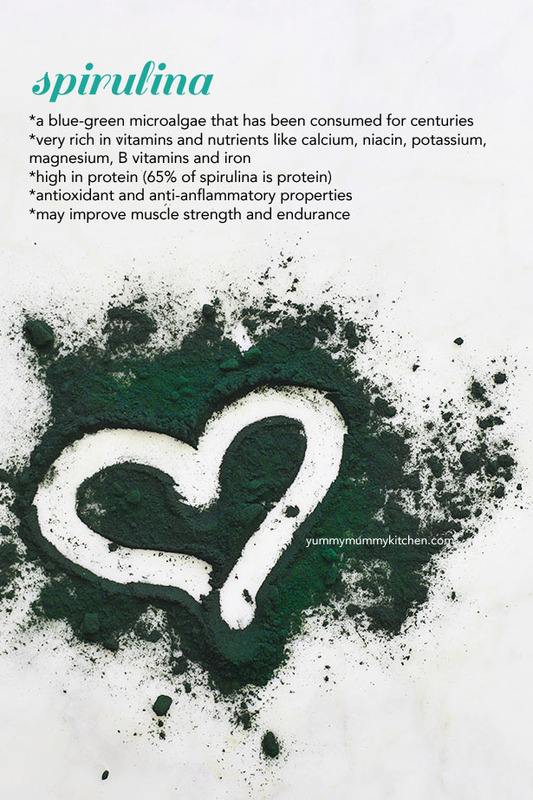 I was surprised to learn just how much of spirulina’s makeup is protein, however. Although many of us have just discovered this superfood in the past few years, it has actually been used for centuries. Spirulina is thought to boost your immune system, reduce inflammation and fight chronic disease, among other benefits (sources below). However, it is not recommended for people with certain conditions such as PKU or those on medicines like coagulants. As with any supplement, if you are pregnant or nursing ask your doctor first. I love to use spirulina in any smoothie, but I find it’s great in a tropical one with mango and banana. 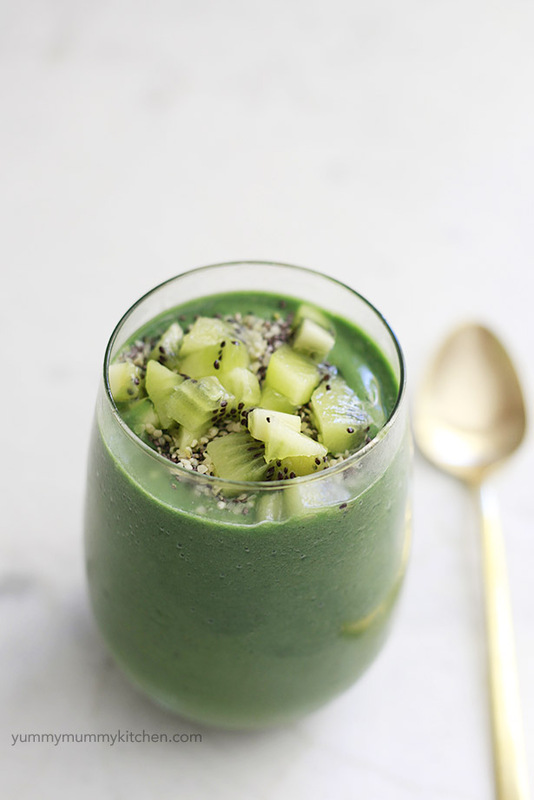 I hope you enjoy this spirulina smoothie! You can find spirulina in most health and natural foods stores. At Whole Foods, for example, it comes pre-packaged and in the bulk bins. Be careful to just get a small amount at first, as it can go bad, and is quite pricey per pound. Amazon may be your easiest bet and there are several available there. A spirulina superfood smoothie recipe. Thanks for sharing the amazing recipe, the spirulina is known for its nutrients value a great source of quality of protein, vitamins, fatty acids, antioxidants. The benefits of spirulina are Detoxes your body of heavy metals, lower cholesterol, balance blood pressure and fight diabetes and many more. keep updating with new health and tasty recipes..